Throughout the circumpolar region, from coastal Alaska, northern Canada, Greenland, and northern Europe to northern Siberia, people protected their feet with layers of inner and outer stockings, inner and outer boots, and inner and outer slippers. Customarily, these layers were made from skins, often with grass or skin insoles. Traditional northern people can identify where you are from and what you do by looking at your skin boots. The styles and materials used to make footwear changed seasonally, regionally, and from one usage to another. Many northern people see footwear as an extremely important part of their clothing because it is the one item that helps humans make the transition from earth to air, from the spirit world to the present world. For example, northerners who move into urban centers or move south often bring a pair of skin boots and carefully store them in the freezer compartment of the refrigerator, even though these items might be impractical when used in centrally heated buildings and on paved sidewalks. People continue to use traditional footwear for ceremonial and other special occasions. Arctic footwear generally includes a sole, vamp, and leg section. Soles are either flat or pleated. Pleated soles vary from fine, diffused pleating to one or two large, rounded pleats per centimeter. Vamp silhouettes range in breadth and length, as well as curvature. Leg sections can be a narrow strip only a few centimeters high up to a long, thigh-high panel. In addition, straps are used on some boots and range from narrow skin laces to broad bands; as well, decorative features range from skin embroidery, hair embroidery, beading, tassels, and much more. Each of these characteristics is distinct to individual seamstresses and specific regions. Men's and women's boots are often decorated differently; children's styles are miniature versions of adult styles. Inuit from northern Quebec, and the eastern and central Canadian Arctic generally prefer flexible boot soles that extend well up over the heel and toe with fine, diffused pleating. Narrow strips of skins are sewn to the bottom of soles for extra traction on some boots. Leg sections are decorated with floral and geometric inlaid skin work. In general, men's boots are decorated with a center front vertical design; women's are decorated with a horizontal design that encircles the boot, possibly representing fertility. Men's and women's boots are usually shin- or knee-high. In Greenland flexible boot soles wrap only slightly around the heel and toe with fine, diffused pleating. Leg sections are painted black or red, or bleached white. In western and eastern Greenland, men and widows generally use black leg sections; red leg sections are used for married women, and white leg sections with lace and floral embroidery around the top are used for unmarried women. In northern Greenland, women's leg sections are often thigh-high and stiffened. The upper edge is decorated with a narrow strip of polar bear skin. Men's boots are generally shin- or calf-high. In some areas of Greenland, both men's and women's boots are decorated with elaborate skin embroidery designs, which are traced back to specific families and communities. Undecorated boots are also used for kayakers and hunters. Indigenous Greenlanders wear their traditional footwear at special ceremonies such as confirmations, weddings, first day of school, and official community events. In the western Canadian Arctic and coastal Alaska, stiff, boatlike boot soles are pleated with fine pleats in the northern communities and coarser pleats in the South. Some seamstresses manufacture many pairs of the finely pleated boatlike soles and sell them to seamstresses from other areas who use them for their own footwear. Leg sections are generally shin- or knee-high. Thigh-high boots are worn by trappers in areas where they might encounter deep water caught on top of the ice and covered by snow. Dance boots are decorated with red yarn, fur and yarn tassels, beaded panels, pom-poms, and strips of different-colored skins or bias tape. The variety of styles used in each Alaskan community is exceptional. For example, over fifteen distinct styles are used in coastal Alaskan communities, while just a few miles away across the Bering Strait in coastal Siberian communities only a few styles are used. In Siberia, seamstresses were required to produce at least 100 pairs of skin boots per year for their collective reindeer farms; in Alaska, seamstresses produced footwear for their family and friends, their handiwork was recognized and appreciated by other community members, and occasionally purchased by tourists or cultural institutes. 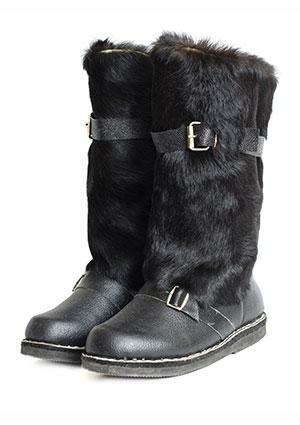 In Siberia, boots are made shin-, knee- or thigh-high from the skins of reindeer legs. Several panels are sewn together to encircle the herder's leg and then attached to a flat, unpleated sole, with a narrow strip of skin sewn in the sole seam. Boots worn by shamans have skeletal lines painted on them using ocher (red clay) mixed with fish eggs or blood. This helps the shamans communicate with the underworld, to show respect, and to appease the spirits thereby protecting people from danger and hunger. In northern Europe, Saami footwear is unpleated with a firmly stuffed curved toe. The curvature, width, length, and overall shape of the toe vary regionally. Saami slip the toe extension under their ski strap, preventing the ski strap from slipping off their footwear. Leg sections usually extend up to just above the ankle and then a handwoven sash is wrapped around the ankle and up the leg. The sash is decorated with gender-specific designs passed along from one generation to the next. Footwear is decorated with narrow strips of red, yellow, blue, and green fabric sewn into the seams. Seal skin pants with boots. Caribou, or reindeer (domesticated caribou), and ringed sealskins are the most common materials used for northern footwear. 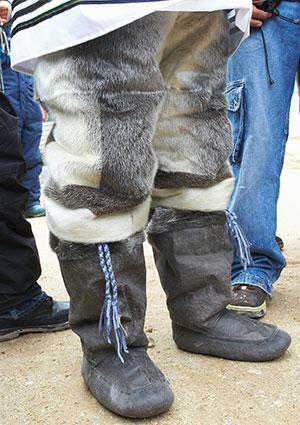 Caribou or reindeer skins are used for winter footwear; sealskins are used for summer. When bearded sealskin is available locally or through trade, this large, thick skin is often used for boot soles needed for all seasons. Caribou or reindeer bull skins are used for soles when extra insulation is needed. These soles are less durable than bearded sealskin but provide much greater insulation. For example, hunters or fishers wearing footwear with caribou or reindeer soles can stand all day on the ice waiting for a seal or fish without getting cold feet. Caribou- or reindeer-leg skins are sewn together to make leg sections for boots. These skins last many years, the soles are replaced as they wear out, and the leg sections reused. Sealskins are either left with the hair on or de-haired by shaving (produces a black skin) or rubbing the hair off (produces a yellowish skin). Some skins are dried and hung outside in the early spring sun to be bleached white. Black and yellowish skins are used for waterproof or water-resistant boots, white skins are used in the winter for cold, dry conditions. Some boots are made from sealskins, which are first made into a bag used to store seal fat. Once all the fat is used the bag is reused to store wild berries mixed with fat. Once that is eaten, the bag is fully impregnated with oils and used to make waterproof leg sections on boots used in unfrozen wet areas during the winter. Other skins used in footwear include a wide variety of species used for the leg sections, including black bear, brown bear, polar bear, wolf, wolverine, fox-leg skins, sea otter, moose, elk, fish, bird, muskrat, beaver, musk ox-leg skin, mountain goat, and mountain sheep. In the early 2000s, some women also use fabric for leg sections. Footwear is made from pieces measured using a complex hand-span system passed down from one generation to the next. Pieces are cut out of skins in a preplanned manner that makes the best use of the skin grain, skin thickness, hair color, and hair direction. They are sewn together using animal sinew or artificial sinew and a steel needle and thimble. Traditionally, bone or stone needles and skin thimbles were used. In most cases an overcast or running stitch is used. On some seams a waterproof stitch is used to ensure the boot stays waterproof. When sewing this stitch, the needle penetrates all the way through one skin and only partway through the other skin. The work is then turned over and resewn with the needle going all the way through the second skin and partway through the first skin, preventing the seamstress from making a hole through all layers in any one place. In Greenland, elaborate skin embroidery is applied around the top of the leg section. This is done by removing the hair from sealskin, bleaching the skins, and then painting them with bright colors. These skins are then cut into very narrow, straight strips and stitched to the leg section. Once it is stitched in place, the strip of skin is cut, allowing the seamstress to sew much smaller pieces than if she had cut the pieces first and then tried to stitch them in place. Many different-colored skins are used for skin embroidery. Today few seamstresses make this type of footwear; they usually purchase these boots from a local business. Footwear and clothing used throughout the circumpolar region has several common characteristics in that it is generally made from caribou and sealskin, protects individuals from the weather and terrain, and enables seamstresses to communicate to their helping spirits. In addition, footwear and clothing depicts the relationship individuals and groups have to their local environment within the distinct cultural frameworks throughout the circumpolar region. See also Boots; Inuit and Arctic Dress. Oakes, Jill and Rick Riewe. Spirit of Siberia: Traditional Native Life, Clothing, and Footwear. Washington D.C.: Smithsonian Institution Press, 1998. --. Our Boots: An Inuit Women's Art. New York: Thames and Hudson, Inc., 2000. Oakes, Jill et al. Pushing the Margins: Native and Northern Studies. Manitoba, Canada: University of Manitoba, 2001.